I am fundraising to reshape two low income schools in Mumbai! Support my project please. Please reach out to me at anjalichhabra.91@gmail.com for any questions. Idea Do a Building as Learning Aid Paint Project to reshape a two low income government Schools of Bandra, Mumbai About my work I am currently in the second year of a youth leadership fellowship program known as 'Gandhi Fellowship' . Here, I work as the Program Monitor of 6 Bombay Municipality Corporation Schools and focus on increasing their student learning outcome by working on the leadership competencies of the headmasters. In the process of my work I also have to live in slums like Dharavi and Bandra, speculate and understand the issues of the inhabitants there and eventually produce at least 3 community projects within the duration of the course. 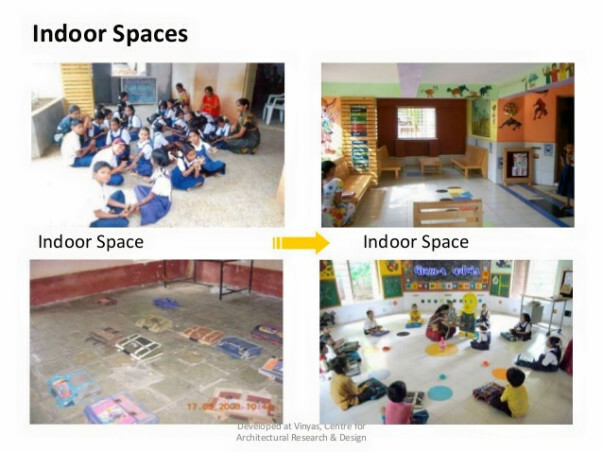 About the Campaign Building As Learning Aid (BaLa) It is an innovative way to conceive and use the various building components like the floor, wall, door, window or even spaces like corridor and open space in such a way that it keeps children engaged in the process of learning throughout. Thus, in such a school, a floor may no longer be just a floor, but a way to understand fractions, or window might become more than a usual window and let a child prepare for skills in writing Hindi alphabets, or a sensitively designed corridor could help children to correctly estimate distances. The municipal schools that I wish to do this project are in Bazaar Road in Bandra West, one of the high profile areas of Mumbai. The total number of kids that could be targeted this year through this are about 800. Those who know this part of Mumbai that despite being high profile this in one of the most difficult communities of bandra, with a lot of migrant population inhabiting it. Further, the government schools of this community have been in existence since pre independence times and hence are in a very bad shape because of lack of maintenance which leads to a very dull learning environment for the kids. This ultimately affects their participation and attendance in the school, and thereby reducing their chances of receiving a quality education. The project will help us add life to the dead classrooms. The painter has given us a budget of Rupees 20 thousand for each school thereby totaling it to 40,000, if we are able to find volunteers from the school community to help paint the project. The kids would also be a part of painting so that they get a sense of ownership in the school. Me and the Headmaster of our school, Mrs. Rehana Surve have been turning from pillar to post to generate funds for the project, right from the NGOs to local area Corporator and MLA. However we are hopeful that we will be able to embark on this journey towards making the school a dream school for the 800 kids who study there and more who would come in the coming years.We are always pushed by people in our lives to pursue our dreams. How great would it be to help weave the dreams of those who have no one else to do the same for them. I am reaching out to you in a hope that you would support me in this endeavour. Accountability I work in the schools as a program monitor and hence am personally looking over the utilization of funds. The donors can themselves get in touch and visit the site for the updates on the project, This is my first fundraising campaign hence I promise to 1) keep posting updates here 2) Be personally available to update any donor regarding the usage of their funds 3) post pictures and updates from classrooms receiving the funds 4) post final accountability report as a PDF for all donors to see Other details to note: 1. Whatever amount you choose to donate, Milaap charges 5% of it + 2.2% card charges. But, I request and encourage you to contribute via Milaap (this page) because that way you also support the awesome work Milaap does with so many deserving people all over. Please go to Milaap's main page to check. Please reach out to me at anjalichhabra.91@gmail.com for any questions. Hi, this is sarita ....just to want to help with little contribution ....I am really proud of u what u r doing !! !